Uni-Ball Eye Rollerball Medium Tip Pen Blue Blister Pack. 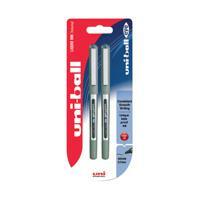 The best selling Uni-Ball Eye Rollerball pen contains liquid ink that is fade and water resistant. Featuring a stainless steel precision tip, this pen ensures a smooth writing experience. Each retail pack contains 2 blue pens with a medium tip to write a neat 0.5mm line. The see-through barrel allows the user to view the ink level during use. Pack of 6 (12 pens in total).